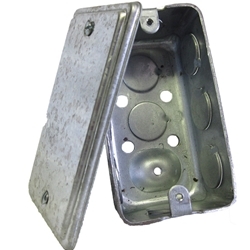 1-1/2" deep handy utility boxes are used for convenience outlets, switches and small junction boxes in exposed work applications. They are great for appliances and machinery. Garvin Industries’ handy utility boxes have a small, rectangular design that allow for power outlets and switches to be installed in small places. They can easily be customized with special holes or knockouts for OEM applications. Handy utility Blank box covers are used to close handy utility boxes. Their tapered edges allow the covers to also be used as single-gang wallplates.